Eerie Unsolved | A Mix-Up of Mysteries, Conspiracie and All Things Spooky! So, it has officially been a year since I have started my blog! But now onto the big announcement – I HAVE A YOUTUBE CHANNEL!! I was on the fence about this for quite some time as I wasn’t sure if a) you guys would like it and b) if I would be any good in front of a camera. But now I have decided to throw caution to the wind and create a channel nonetheless. Click here to be taken to my channel and subscribe to be notified when a new video goes up. My first video will be going up on Wednesday, where I talk about the infamous 27 Club! I posted on social media – @Eerie_Unsolved on Twitter – that I was going to Screamfest and a lot of you said that you wanted me to do a bit of a review with some videos and photos but I have only been able to do half of that. Caught up in the terror of the evening, I was unable to get any good, usable photos/videos so unfortunately I do not have any to share with you but I am still going to give a review of the evening in case you guys are thinking of going next year. Screamfest UK is an annual Halloween fright night held at National Forest Adventure Farm near Burton-upon-Trent, UK. I happened to have stumble across a video on YouTube that someone had uploaded of a vlog from last year and I thought it looked really cool so I decided to book tickets for it – which were very reasonably priced as well, might I add. Insomnia – Imagine being stuck in a young child’s nightmare … and not being able to wake up. Love Hurts – Enter and find your true love … just hope you are not one of the ones rejected. Freakout – Enter the funhouse but watch out for the cuckoo clowns. Demonica – You have sinned … and now you must face the realm of Demonica. Dia de los Meurtos – Enter the corn maze for an evening of celebrations … but watch out for the gang members that have broken out of the nearby jail. The way I’m going to set this out is I’m going to do a brief review of each scare (spoiler free, don’t worry) and then give an overall review of the evening as a whole. This was the first attraction that I went through when I got to the farm. Using strobe lighting and smoke machines, the special effects really made for a good scare, along with the demonic looking clowns. Maybe it was just me who thought they looked demonic, because I am petrified of clowns anyway, but I know they made everyone jump multiple times throughout the attraction. They varied from women in face paint to full-on clown costumes with creepy, exaggerated smiles, and this range of scare actors really made the attraction all the more scarier – you had no idea what was going to be around each corner. As with all of the scares, the scare actors weren’t shy about getting right in my face to scare me and boy did it work, haha. Out of the five attractions I would rate this as a 4/5 as it was definitely fear inducing and set my heart beating 1000x faster than usual. Lovehurts was the second attraction that I went to. Taking inspiration from all of the reality dating shows on TV at the moment, this attraction was based on ‘finding true love’ in the Sewageworks! Again, the use of strobe lighting and smoke machines really added to the atmosphere and with the use of sprinklers, really made me feel like I was in a dingy sewer. This time, most scares came from loud noises or growls and was definitely spooky! Top it all off with the reveal of the bachelor at the end and it really made for a scary experience. I would rate this attraction a 2/5 – it was scary but I felt like it just missed the substance that the other attractions had. New for 2018, Insomnia worked on the idea of a young child’s nightmare. Dark, twisting corridors and subtle details added to an overall sense of dread and paranoia within this attraction. Playing on the idea of, once again, clowns and the boogeman, the attraction followed the progression of a nightmare from the dread, to the fear, to the relief when it is all over. I would rate this attraction a solid 4/5 because it had a good plot that it followed and it was definitely creepy! This attraction was definitely my favourite out of all of them! It began with a wagon-rise through the farm to the start of the maze. During the ride, a fake news story sets the scene for the attraction. The scare actors in this one were amazing ad with just the right balance between humour and horror, he mood definitely shifted the further into the maze I went. I would rate this attraction a 5/5 as it was just so awesome and had so many different elements to it!! With such a dramatic opening line, I was prepared for a scary experience. Set mostly in the dark, this attraction definitely had an eerie feeling about it! The scare actors wore mask that were, quite frankly, terrifying, and I had a guy walking through the attraction behind me who I did not know but who decided to scare the hell out of me by screaming down my ear – he wasn’t even a scare actor! I would rate this a 4.5/5 because although it was scary and had some sort of story that it was following, it just didn’t quite compare to the corn maze. Overall, I would definitely recommend going to Screamfest in October/November 2019. If you like horror, this is definitely a night out that you would enjoy! And that’s all I have for you today folks. INTERVIEW with Paranormal Youtuber KYELUH! Just to let you guys know, there is going to be a Halloween post going up on Wednesday! I know I wasn’t able to complete my ’31 Days of Halloween’ series but I am definitely going to upload a post on Wednesday and it’s going to be a big post for me and I really, really hope that you guys will enjoy it. Today, I have had the wonderful pleasure of interviewing paranormal YouTuber Kyeluh. She creates awesome paranormal content so you guys should definitely go and check her channel out and show her some love because she really deserves it! At what age did you become interested in the paranormal? There was never one specific day that I became interested in it, and I think that’s because of growing up in a house that was so haunted. I don’t ever remember a time not believing in things that go bump in the night, I always felt a pull to it even though it was terrifying. When there was a scary movie on TV I always wanted to watch it, when adults would tell scary stories I always wanted to hear it. As soon as I was at an age where I had freedom I always wanted to go to cemeteries and look for spooky things to do. It’s just always been an interest! How did you find out what ghosts were? My family was very religious so my mom would always try to explain to me that whatever it was, was evil and that I was protected against it. My family never believed that ghosts were once people but that they were demons. I don’t believe that way now, but I still don’t know what ghosts are. I THINK they’re spirits of people that passed away and I’ll continue to try and search for answers. What/who inspired you to create a YouTube channel? I originally started my channel with a different path in mind because I didn’t know paranormal YouTube was even a thing! I decided to upload a paranormal experience video because I always had things happen and it was Halloween, so I actually found all of my favorite paranormal channels after I had already started posting my own experiences. Would you go back to the Sallie House to investigate further? The energy there was so intense and I know there’s so much more to be explored there. I’d totally go back! What was it like doing a paranormal investigation with Michael Scot? Michael Scot is absolutely incredible, so professional and REAL. He was so wonderful to investigate with and I feel so lucky that I got to hunt with him! His passion for what he does is so contagious and he’s truly someone I look up to in this community. What is the most convincing piece of paranormal evidence that you, or someone you know, have captured? It’s so hard to pick just one, so what I thought about at the top of my head was the whistling and voices some friends and I caught on a digital recorder back in 2012 at the crescent hotel. It was the first time I ever had REAL evidence of something paranormal. It was so exciting! What are your top 5 favourite horror movies? My top 5 favorite horror movies would have to be ‘The Ring’, ‘Nightmare on Elm Street’, ‘The Visit’, ‘Psycho’ and ‘The Others’! It’s so hard to just pick 5 though because I also LOVE ‘The Babadook’ and ‘The Sixth Sense’. What advice would you offer to someone who wanted to start doing paranormal investigations? Trust your instinct. That’s the most important thing in paranormal investigations to keep yourself protected. Also, always be respectful to the spirits and your surroundings, and make sure you have permission to investigate or that the location you are hunting is safe. What is you go-to piece of paranromal investigative equipment? This may sound weird, but myself. With all of the paranormal investigation equipment I’ve ever used one of the best has been my own body because I’ve always been super sensitive to it. But when it comes to evidence for other people, having a really sensitive digital recorder is incredible. I’ve caught so many voices on them that my camera did not! What is your scariest paranormal experience? My scariest paranormal experience happened to me when I was a child in my own neighborhood late at night. I told the experience on my channel years ago, and it still scares me to even talk about it. A boyfriend and I were sitting on my front porch and we both saw one of the most confusing things I’ve ever witnessed in my life. It was a green smokey figure across the street from us in my neighbors yard floating in her garden. I never expect anyone to believe me when I mention it because it’s hard to believe it myself even still. My mom saw it as well and none of us were ever able to forget it. What was it like growing up in a haunted house? Terrifying. I always hated nights and could never sleep, so I’d lay awake in my bed wondering if it would be one of those nights where something happened. My sister and I shared a room for years and it was a frequent event for the two of us to hear something and go running to our parents crying. We hated nights in that house and sometimes I remember what it felt like living there and it gives me chills. How old were you when you had your first paranormal experience and what was it? I’m not sure how old I was because I was so young, and I’m not sure which experience is actually my first. It’s either the time I saw the two “boys” while I was playing in my backyard, or when I saw a smokey figure come from behind my bedroom door and disappear. I was so little when those things happened that I’m not entirely sure how old I was at the time. Have you ever experienced a positive paranormal experience and if so, what was it? I have! When we stayed in the crescent hotel in 2012, we got some of the most fascinating evidence communicating with a spirit we believed to be Theodora. She is who I believe kept whistling while we were there and her presence actually felt calming. She also visited the only guy that was with us(she’s known to be drawn to men) and made the entire room smell like perfume. Have you ever experienced a demonic paranormal experience and if so, what was it? I don’t think I’ve experienced anything demonic to my knowledge. But I can’t say I’m complaining! What reactions do you get when people find out about your interest in the paranormal? Most of the time I always got positive reactions when I’d talk about it, maybe some of my friends growing up didn’t like talking about things because it scared them. But for the most part people didn’t seem to judge me for it, at least to my face! Do you believe in any conspiracy theories and if so, which ones? Describe your feelings towards the paranormal in one word. Have you ever seen the apparition of, or felt the presence of, a loved one? I haven’t lost many loved ones luckily so no, I haven’t experienced this. My cat recently passed away and I find myself wishing I could have some sort of experience that let me know she was with me, but I haven’t. If you could make one creature/legend/myth real, which would it be and why? Its like I don’t want Bloody Mary to be real but also, I do! I just want to meet her. I’m pretty sure I would have regrets but in my mind it sounds like a great time! Do you own any haunted items and if you do, have you ever had any experience with them? I don’t own any haunted items, but I have a bunch of old porcelain dolls that I used to collect and had set up in my haunted house. There’s this one doll that as a little girl was convinced could see me. Her eyes would glow red if the light hit them just right and she just gave me an odd uncomfortable feeling. I’m not sure why exactly but I kept her and she still creeps me out. What is the creepiest unsolved mystery you know of and what are your opinions towards the case? Elisa Lam! I’ve watched so many videos on her disappearance and it creeps me out so bad what happened to her and how nothing makes any sense. Plus that video of her and the elevator is so creepy! It’s so intriguing because every logical answer about what could have happened to her makes no sense, so it just feels like there was more to it and that it was paranormal. Thanks for reading guys, I really hope that you guys enjoyed this post! Definitely click the Follow button down below so that you will be updated when I upload on Wednesday and when I upload any future posts. Also, a huge thank you to Kyeluh for taking the time to do this interview, it really means a lot and you guys should definitely go and check her out! So as I have reverted back to posting once a week, here is this weeks post, an interview with the wonderful @ParanormalKativity. Definitely go and check her out on Twitter and also go a subscribe to her YouTube channel. She creates awesome videos on spooky stuff, especially unsolved phenomena and creepy unboxing videos – go to her channel here. 1. What is your scariest paranormal experience? My scariest paranormal experience was when my cousin and I stayed at her family’s beach house and had to leave early due to so much activity. I wish so much now that I could re-live that experience and try and record evidence or do more research in such an active environment, but at the time we were much younger and not in a paranormal investigation mindset. We were so caught up in experiencing the activity that we didn’t think about anything besides getting our things and getting out of there. We saw apparitions, heard phantom voices, music, and singing, and we saw lights flash and objects move. It truly was amazing and if time travel ever exists, I am going back to try and capture it all on video! 2. What is the experience that made you believe in the paranormal? I have always been a believer. It’s probably because my earliest memories have to do with my imaginary friend, the shadow man. Finding out at an early age that my imaginary friend had information my deceased uncle knew and being told I couldn’t play with him anymore was enough to make anyone curious about what else exists that we just can’t perceive. 3. Do you believe that dowsing rods, pendulums, etc, can be used to communicate with spirits? I feel that dowsing rods, pendulums, and all other tools that involve physical contact to make them move are tools to tap into your own intuition. Could YOU be able to gain information from somewhere else and have the answers manifest physically through you? It may be possible, but I think if that’s the case, you could develop your intuition to a point that you could get that same information directly without the use of tools. Having said that, I don’t think that any time those tools move that you are getting a message from beyond. Those tools are all very easily manipulated, both intentionally and unconsciously. I think they are very interesting and fun to experiment with, but the information you get from them should always be looked at skeptically. 4. What are your opinions on the Simulation Theory? I think it’s super interesting! Anything is possible! 5. Have you ever experienced a ‘Glitch in the Matrix’ and if so, what happened? I have experienced many “glitches” over the years! A couple of my favorites include driving past the same intersection twice while still driving straight down the same street, and when my cell phone called my home phone and my friends phone while no one was touching it out in my car. Those stories I go into in full in videos on my channel as well! 6. What inspired you to create a YouTube channel? I loved watching other people sharing their paranormal experiences, and one day I decided that I should do the same! Plus, all of my friends had already heard all of my spooky stores before, so I thought it would be cool to share them with people who might be able to relate! 7. If you could talk to a ghost and get fully coherent answers, but you only three questions, what would you ask? Who am speaking to? How are you communicating with me? Do you have anything you want to tell me? (I would hope that through those questions I could prove what occurred, get some kind of idea of what speaking to someone we can’t physically perceive really means (because a ghost is kind of a catch-all term), and find out why this communication was happening with me in the first place) If I ran out of questions, I would try and say Thank You before they left. 8. Have you ever seen the apparition of a loved one? If so, what happened? I can’t say 100% for sure that I have. I have had a lot of experiences that could be attributed to loved ones, but not that appeared that way so I can’t say for sure. 9. What advice would you give to someone who wanted to start doing paranormal investigations? I would say to have fun, be careful with protecting your energies, and don’t worry about having specific equipment, because you really can learn a lot with very little. 10. What conspiracy theories, if any, do you believe in? I like to think I entertain all of them! I don’t know if I 100% believe in any of them though.The only one that comes to mind that was just not for me would be the flat earth theory. 11. What is your most recent paranormal experience? I record all of my experiences on you YouTube channel and haven’t had any since my most recent paranormal update. 12. What is the scariest/most unexplainable experience you have had with Ina and Lorelei? My dolls are super chill. I think they like it here so really, the minimal activity I got when they first arrived has seemed to have stopped…for now. 13. What is your favourite item in your Cabinet of Curiosities and why? I can’t choose a favorite item in my cabinet. I love my herbs, stones, fragrance oils, art, gifts and letters from people who have connected with me from YouTube… it all means so much to me! 14. What is the top 5 horror films you would recommend to someone? Elvira Mistress of the Dark (because it’s my favorite for so many reasons), Tales from the Darkside & Trick-R-Treat, because I love anthologies, and The Rocky Horror Picture Show and Little Shop of Horrors because they are my favorite musicals and are horror movies too! 15. What are your opinions on ghost hunting shows such as Ghost Adventures and Most Haunted? I love paranormal TV shows. They are thoroughly entertaining and give you a chance to see haunted locations you may not see otherwise. Now the legitimacy of the shows is another thing, but I do think you get moments of genuine activity which are really cool! Thank you so much Kat for taking the time to answer these questions, it really means a lot to me! You guys should definitely go and check her out here and tell her that you came from Eerie Unsolved. This is a poem written by T.S Eliot; the poem is called The Wasteland. It is based on the story of Sir Ernest Shackleton, who claimed that he had experienced ‘Third Man Syndrome’ during the final leg of his journey in the mountains of South Georgia. Third Man Syndrome is when an individual feels and unseen presence with them, whom provides comfort and/or support during traumatic or dangerous times. During that long and racking march of thirty-six hours over the unnamed mountains and glaciers of South Georgia, it seemed to me often that we were four, not three. The publication of this admission resulted in survivors of other extreme hardship to come forward and share similar experiences. Some examples of similar stories include Frank Smythe, one of the first climbers of Mt. Everest, who claimed to feel a presence with him after the last of his companions had turned back; the presence felt so real that he even broke off some mint cake and tried to give it to them before realising that they weren’t there. Another example is that of Peter Hillary, who was on an expedition to the South Pole in 1998 when he claimed that he was accompanied by his mother, who had died in a car crash 20 years prior. It was found that the group in which it was most likely to occur in was climbers, with sailors and shipwreck survivors second, followed by polar explorers. This presence is often described as a guardian angel or an imaginary friend of sorts. It is reasonable to think that the presence may be a defence mechanism however, such feelings are reported in much less dramatic scenarios. For example, the feeling of an unknown presence is common in both sleep paralysis and even Parkinson’s disease. What is interesting is that individuals who have experienced brain injuries and experience third man syndrome seem to all have damaged their temporoprietal junction (TPJ). The TPJ has been found to play an important role in how we see our self image. So could third man syndrome be a projection of ones self as a defence mechanism. I would love to hear your thoughts of what third man syndrome really is so be sure to leave me a comment down below! So today, I’m going to do a true crime post. I don’t really know how to preface these posts anymore because usually, I’d update you on what has happened through the week but with me doing this every day, I don’t really have a lot to update you on anymore. If you don’t already follow me on Twitter – @Eerie_Unsolved – you definitely should because that is where I post any updates whether that be for my blog or just for stuff in general. I am also looking for YOUR stories for a followers story so be sure to send them to me either via the contact page down below, the comments section or send me a DM on Twitter. Kris Kremers and Lisanne Froon were two Dutch students who died either on or shortly after April 1, 2014, whilst out hiking in Panama. Froon was described as aspiring, optimistic and intelligent; it was also stated that she was a passionate volleyball player. Kremers was decribed as open, creative and responsible. Both of the girls had grown up in Amersfoot and Froon had not long graduated with a degree in Applied Sciences from Deventer the previous September. Kremers had also just completed her studies in Cultural Social Education, specialising in Art Education, at the University of Utrecht. Only a few weeks prior to the girls leaving for Panama, Froon had moved in with Kremers in a dorm room in Amersfoot and they both worked at a cafe/restaurant In den Kleinan Hap. Both girls had been saving up money for six months prior to their journey and planned to go to Panama on a special trip to learn Spanish. They also planned on volunteering, hoping to work primarily with children. The journey was also supposed to be a graduation present for Froon. Kremers and Froon arrived in Panama for a six-week vacation on March 15 2014. The two girls toured Panama for two weeks before arriving in Boquete on March 29 to live with a local family for a month whilst volunteering with children in the village. On April 1, the women went joking with their hosts’ dog, leaving at around 11.00am near the clouded forests that surrounded the Baru volcano, possibly the trail of Pianista, not far from Boquete. The two girls wrote on their Facebook that they intended to walk around Boquete and it was reported that they had been seen having lunch with two young Dutch men before embarking on their hike. The womens’ hosts became worried when their dog returned home later that day when their dog returned home without Kremers and Froon. In addition to this, Froon’s parents stopped receiving texts from their daughter, which they had been receiving daily. On the morning of April 2, Froon and Kremers missed an appointment with a local guide. On April 3, authorities began aerial searches of the forests and even local residents began searching for the young women. On April 6, Kremers’ and Froon’s parents arrived in Panama, along with police, dog units, and detectives from the Netherlands, all prepared to conduct a full-scale search of the forest for ten days. They also offered $30,000 reward money for any information on the whereabouts or the fate of their daughters. Ten weeks later, a local woman turned in a backpack that ended up belonging to Lisanne Froon. She claims that she found the bag in a rice paddy by a riverbank near her village of Alto Romero in the Bocas del Toro region of Panama. She also claimed that it had not been at the paddy the day before. It was found that the backpack contained two pairs of sunglasses, $38 USD in cash, Froon’s passport, a water bottle, Froon’s camera, two bras, and both of the womens’ phones. All of these items were packed, dry, and in good condition. Research into the womens’ phones showed that for some hours after the start of their hike, someone had dialled 112 (the international emergency number) and 911 (the Panama emergency number). Further evidence showed that Froon’s camera contained photos from April 1 suggesting that the two women had taken the trail overlooking the Continental Divide and that they had wandered into the wilderness hours before their first attempt to dial 911; the photos showed nothing abnormal or unusual in their expressions. April 8, ninety flash photos had been taken on the camera between 1.00 and 4.00 am, seemingly deep in the forest and in near-complete darkness. Some photos with twigs, plastic bags and candy wrappers on top of a rock. One shows what looks like toilet paper and a mirror on another rock. Another shows the back of Kremers’ head with what looks like blood on her temple. The discovery of Froon’s backpacks led to new searches along Culebra. For example, Kremers’ jean shorts were found zipped up and neatly folded neatly atop a rock on the opposite band of the tributary a few kilometres away from where the backpack had been found. Despite this, witnesses later claimed that that the jeans were not folded neatly but, in fact, found in the river itself. Two months after this, close to where the backpack was found, a pelvis and a boot were found with a foot still in it. Soon after this, thirty-three widely scattered bones were discovered along the same stretch of river and DNA testing confirmed that the bones did in fact belong to Kremers and Froon. Froon’s bones still had some skin attached to them but Kremers’ bones appeared to have been leached. A Panamanian forensic anthropologists later claimed that under magnification, ‘there are no discernible scratches of any kind on the bones, neither of natural or cultural origin – there are no marks on the bones at all’. There are two main theories about what happened to the two girls – either murder or accidental deaths. Both seem to have their fair share of ‘evidence’ to support them. One theory is that the girls lost their way whilst hiking. Because of this, it is believed that they could not escape the harsh conditions of the wilderness and somehow fell into the river. The river then dragged the girls and they drowned. It is believed that one girl got hurt or died first, and that this was followed by the other. It is possible that one of the girls was already dead when the ninety flash photos were taken and experts believed that these photos may have been way for the surviving girls to document what had happened to them, almost like a record of events. The circumstances behind the deaths were rather suspicious and as well as evaluation, there is a lot of evidence that suggests that the girls were in fact murdered. The local law enforcement did not conduct a serious investigation into the case as they were scared of hurting the tourism. It was argued that the the bleaching of the bones and the total fragmentation of the bodies did not logically link the case to accidental deaths. It was noted that the way in which the bodies were treated mirrored how Mexican cartels disposed of their victims’ bodies and experts say that that the girls’ remains have striking similarities. It is also possible that a serial killer is roaming Boquete are as over two dozens other unsolved killings and disappearances occurred in the same area of Panama over eight years – with more than two thirds of the cases coming since 2014, when Lisanne and Kris went missing. I would love to hear your thoughts on the case either in the comments down below or as a DM on Twitter. Day 7, here we go! The Hollywood Roosevelt Hotel is a hotel located at 7000 Hollywood Boulevard in the Hollywood district of Los Angeles. It opened on May 15, 1927 and it is the oldest operating hotel in Los Angeles. It boasts 300 rooms, 63 suites and 2 restaurants distributed over 12 floors and it sits along the Hollywood Walk of Fame. Notable suites are the Gable-Lombard penthouse, a 3200 sq. ft duplex with an outdoor deck and is named for Clark Gable and Carole Lombard who used to stay in the room for five dollars a night and the Marilyn Monroe suite, where the actress lived for two years early in her career. Famous residents at the hotel also include Montgomery Clift, who stayed at the hotel for three months in 1952 during the filming of From Here to Eternity, Shirley Temple, who learned to do her famous stair-step dance routine on the hotel stairs and even Charlie Chaplin. With a hotel with so much history, it isn’t surprising that the hotel has also had it’s fair share of paranormal reports. Marilyn Monroe is said to have remained at the hotel after her death and it is said that a mirror that once hung in her room is haunted by her spirit. It has been reported multiple times that guests and staff alike have looked in the mirror and seen the apparition of a young woman with blonde hair standing behind them. Out of the 12 floors in the hotel, the ninth is believed to be the most active. Guests often report loud, thudding footsteps and unexplained voices and other noises, along with the apparition of Montgomery Clift either being seen in the hallways or heard practising his trumpet. Some of the most noted paranormal occurrences occur in the hotel’s ballroom. In one corner of the ballroom, it is common for guests to report hearing voices and feeling cold spots. Many guests also report seeing people dancing around the ballroom and sightings of Marilyn Monroe have also been reported, whether she be dancing or posing. Other reports in the ballroom include a five-year-old girl named Caroline, who is constantly looking for her mother, and the spirits of two men. One of these male spirits is widely believed to be an aspiring actor who had attended on of the Academy Award banquets, hoping to win an award, and the second is said to be an entertainer, who likes to play the piano. Two of my favourite YouTubers, LoeyLane and Hailey Reese, made multiple series’ investigating the hotel and the evidence that they captured is chilling. If you find the stories of the spirits at the hotel interesting, you should definitely check out their series’. Welcome to day 6 of my ’31 Days of Halloween’ series. If you’re enjoying the content that I’m putting up or if you have a spooky story to share or an idea for a future blog post, leave me a comment of send me a DM on Twitter – @Eerie_Unsolved . I would also like to highlight the fact that today’s post is a collab post with the wonderful Brittney Grimes. In her video, she shares a CRAZY experience of Déjà Vu that she had and I’mm going to be honest, it gave me CHILLS! If you want to check out her video, click here or check her out on Twitter here – @britgrimesyt . Déjà Vu is a French phrase that literally translate to ‘already seen’. It is often reported as an instance where an individual feels as if the current event they are experiencing has already occurred, although it hasn’t. It is reported that around 70% of the world’s population have experienced Déjà Vu to varying levels of intensity, whether that be knowing what someone was going to say next or being able to warn people of upcoming bad fortune. It is has also been found that most incidents occur in individuals aged between 15 and 25 years of age, although it is not know why. Although there is no definite explanation as to why Déjà Vu occurs, there are many theories including both spiritual and scientific. The parallel universe theory of Déjà Vu suggests that the moments that we experience as Déjà Vu are in fact moments being repeated in this timeline that have already occurred in a parallel one. Theoretical physicists have already claimed that there is a possibility that parallel universes may exist so it isn’t too far-fetched to believe that it may be possible for a parallel version of yourself to experience the same thing you experience and thus, create a feeling that you had experienced something before that you hadn’t…in this timeline anyway. 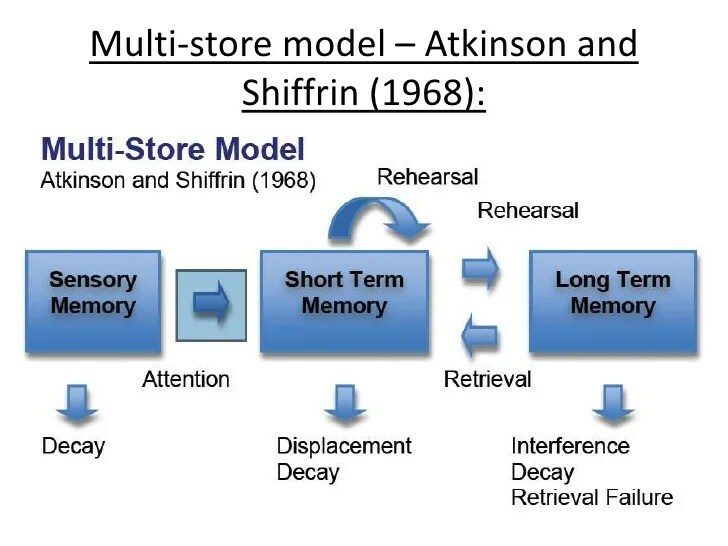 However, in the theory proposed, something goes wrong between the short-term and long-term memory stores and instead of the information being fed from the short-term memory store to the long-term memory store, it instead goes the other way and is immediately imported to the long-term memory and then ‘retrieved’ as a memory, making the individual believe that they have already experienced the scenario although they haven’t. Most of the time, occurrences of Déjà Vu often stem from dreams that an individual had had prior to the event. Most of the time, however, the individual doesn’t realise that their Déjà Vu stemmed form a dream as it all occurs so quickly. In this case, it is fair to presume that the dream that it stemmed from could be considered a premonition as it would have, in some sense, predicted the future. Much like the parallel universe explanation for Déjà Vu, the past life memory explanation says that you have experienced the moment before but not in your current timeline. Instead of a parallel universe, however, this explanation says that he memory comes from a past life, which is defined as a past incarnation. Unfortunately, I haven’t had any SUPER CRAZY Déjà Vu experiences like Brittany has but I do have a few circumstances that I would like to talk about. For example, I have had times when I have been able to say what a friend was going to say as they say it, even when it is really obscure and there is no way for me to know it. It is funny, however, to see their faces when this happens. Another thing that happens to me quite a lot is that there a times when I will be listening to the radio and a song that I have never heard will come on and I will somehow know it pretty much word for word. This is quite bizarre because quite frankly, I despise modern pop music, so for me to know the words is really quite bizarre. And that’s about all I have for you today. Make sure you go and check out Brittany’s video and go and follow her on Twitter and subscribe to her YouTube. 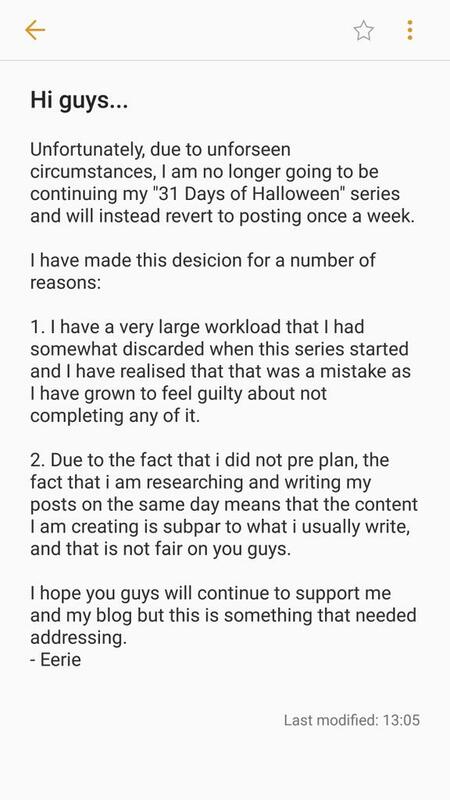 Although my ’31 Days of Halloween’ series is already locked in place, I definitely want to hear your suggestions for future blog posts so be sure to leave them in the comments down below or send me a DM on Twitter – @Eerie_Unsolved . If you haven’t seen the first two parts of my Mandela Effects sries then go and read them here and here. Day 4, here we are! I’m really enjoying this series; let me know if you are too either in the comments down below or via a DM on Twitter – @Eerie_Unsolved . On November 22 1987, in Chicago, Illinois, there was a television signal hijacking involving at least two unknown individuals. The first signal intrusion occured during the independent station WGN-TVs (Channel 9) live telecast of their primetime newscast, The Nine O’clock News (now known as WGN News at Nine). The intrusion happened during a report on the highlights from the Chicago Bears’ 30-10 home victory over the Detroit Lions. Suddenly, the screen went black for fifteen seconds and when image returned, it was no longer of the sports anchor but rather an unknown assailant wearing a Max Headroom mask and a pair of sunglasses. There was no audio in this bizarre broadcast other than a bizarre buzzing sound and an oscillating tone. The hijack was soon thwarted after engineers at WGN switched their broadcast frequency to the John Hancock Centre. The incident left the sports anchor bemused, saying ‘If you’re wondering what just happened, so am I’. He also went on to say that he believed that the computer running the news ‘took off and went wild’. After this, he resumed his report on the Bears’ victory, trying to put the strange occurrence behind him. The second signal intrusion occurred at around 11.15pm Central Time. It occurred during a broadcast of the Doctor Who episode Horror of Fang Rock. This time, the signal intrusion was accompanied by a static crackling audio. The scheduled programming had been interrupted by static and then the unidentified man appeared wearing the same mask and sunglasses he had been wearing previously. The first words spoken in this intrusion were ‘That does it. He’s a frick’n’ nerd’. The masked man then went on to mention sports pundit Chuck Swirsky, whom he claimed he was better than, going on to call him a ‘fricking liberal’. At this point, the man started to moan, scream and laugh. He continued to laugh and utter phrases of nonsense including New Coke’s advertising slogan – Catch the Wave – whilst holding a can of Pepsi. At this time, Max Headroom was being used as a coca-cola spokesperson. The man then threw the can away and off camera. He then leaned towards the camera and ‘flew the bird’ to viewers, with a rubber extension on his middle finger. The man then retrieved the Pepsi can and sang ‘Your love is fading’ and removed the rubber tubing and began to hum the theme song to Clutch Chicago, pausing to say ‘I still see the X’ – this referred to the final episode of the series – before resuming humming again. The masked man then began to moan painfully, exclaiming about his piles (muffled audio meant that this was commonly misheard as ‘files’). After this statement, a flatulence sound was heard and he pretended to defecate. He then held a gardening glove up to the camera and claimed that his ‘brother was wearing the other one’. He pulled the glove on and then continued ‘But it’s dirty! It’s like you got bloodstains on it’, throwing the glove away in disgust. The picture then suddenly cut to an image of the man’s lower torso with his buttocks partially exposed, holding the mask up to the camera with the plastic tubing in its mouth. He was howling ‘They’re coming to get me!’ before an unidentified accomplice in a French maid outfit appeared and told him to ‘bend over’ before beginning to spank him with a fly swat. I don’t know why but just watching it makes me feel ill, like it gives me a headache and makes me feel nauseous; does it affect anyone else that way? WTTW, the second channel that was interrupted, found that it’s engineers were unable to block the hijacker due to their being no engineers on duty at the Sears Tower, which is where their transmitter was. ‘By the time people began looking into what was going on, it was over’ he told the Chicago Tribune. The station were able to obtain recordings of the intrusion and were eventually able to narrow the location of the filming down to a warehouse district, although the perpetrators were never identified. The broadcast made national headlines the next day and WTTW received numerous phone calls about what had happened. An investigating FCC engineer quoted at the time said the perpetrators of the intrusion faced up to a $10,000 fine, a year in prison, or both. He was quoted as saying ‘It is a very serious matter because illegal interference of a broadcast signal is in violation of federal law’. Eventually, however, the FCC were able to figure out how the hijackers had managed to intrude. They wouldn’t have even needed expensive equipment, as had initially been suspected, but rather all they would have had to do was place their own antenna dish between the transmission tower – all they would have needed was a good position and good timing. I know this post was a lot shorter than my previous ones but I thought I would share this as I thought that the broadcast is quite creepy and it’s scary to think that people could do something like this and not get identified for it. I’m sorry if this post was boring but I’ve got a lot more posts coming your way so be sure to keep your eyes peeled for them. Follow Eerie Unsolved to be notified of new uploads every Sunday!